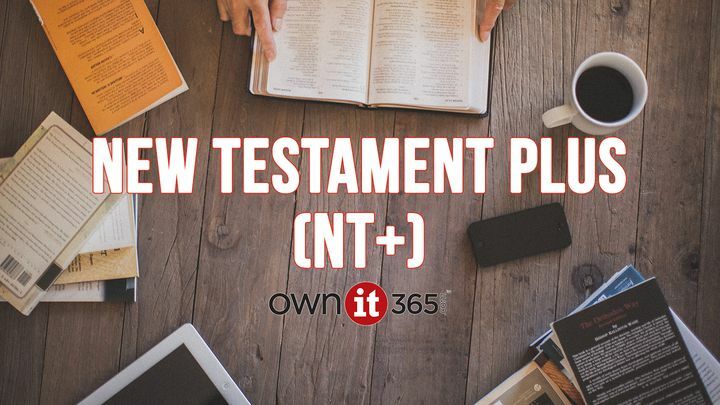 OWNit365 New Testament (NT)+ Plan - NT+ is a 6-day-a-week revolutionary way to read through the New Testament. Instead of reading straight through the New Testament, the NT+ plan is strategically divided into reading based on authorship. Five days a week, you’ll read one chapter in the New Testament. On the sixth day, you’ll read a chapter in the Old Testament that was referenced in the New Testament reading that week to give you context for its New Testament emphasis. NT+ is a 6-day-a-week revolutionary way to read through the New Testament. Instead of reading straight through the New Testament, the NT+ plan is strategically divided into reading based on authorship. Five days a week, you’ll read one chapter in the New Testament. On the sixth day, you’ll read a chapter in the Old Testament that was referenced in the New Testament reading that week to give you context for its New Testament emphasis.